Well got round to getting and installing my new card over the past few days. Here is the actual card with the improved vented cooler. This is now NATIVE HDMI connection. The 4870 used a connector. So far its been a little troublesome getting ideal settings with the new card. For some reason the only working resolution is 1280x720 (720P) HDTV on the card CCC settings. This screen requires a refresh rate of at least 50mhz. The basic resolutions only use 30-25 on this card. They come up jittery and look awful. For some reason the 720P HDTV setting is the only one using the 50/60mhz refresh rate and that works well. So that is good at least. Only briefly benched the card and it was slaughtered. Whey behind the likes of the Nvidia 260GTX and my older 4870 ? Should it not be around this level of performance. ? Settings maybe here. ? So from me very mixed feelings on the 5770 so far. 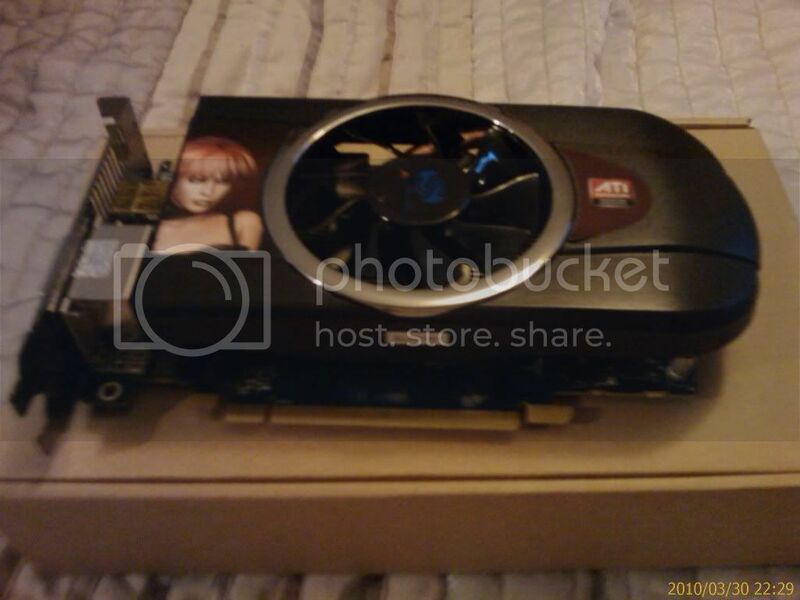 Always used the top end graphics cards and been impressed but this offers very little from what i had. So far. Already potentially considering another for crossfire to give it some juice. Comments and suggestions welcomed at this stage. It should be really close to the 4870 in performance what did you do to bench? Should this card not be quite the upgrade compared to the other considering it is 1GB GDDR5 DX 11 and now has a Native HDMI connection? maybe there is something I am missing? Good luck with it Craig! Yeah it should be I have no issues with either of mine, it could just be driver related. That is what i am thinking gents. I am thinking the driver issue or something. However things have improved. I ran the bundled installation CD today. I previously downloaded latest from AMD. It basically installed the older CCC and the hydra-vision. Nothing really changed to be honest but some other options were available that were grey'ed out originally in CCC. Nothing was changed with them. I been basically testing with Sandra lite free benchmarking tool. Earlier when originally installed it scored less bandwidth than a 9600GT. Now its only 70% slower than a 4870x2 or a 260GTX SLI. So better than half so nearer 4870 territory. The main thing getting up my noise is the resolutions. All the others are screwed up. Its got power and working via the incorporated HDMI port. Only this 1280x720 720P setting on HDTV works well. ?? The other shake , wobble and look like its about to crash at any time. To me this is not right surely. ?? What about quality of HDMI cable guys. ? I know this cable is a budget one and this new card supports HDMI 1.3 rather than 1.0 as of the first adapter for the 4870. Could this be playing a part you think. ? But it worked well on the 4870 right up to 1280x1080i 1080i with only slight wobble. Now on that setting you cant see anything its jumping like anything. I just hooked up my 5770 to my 47 inch tv to test through my htpc and it works great on all resolutions right up to 1080i, I'm using a new HDMI cable I just picked up 3' for 48 bucks, Im not sure if it would help or not in your situation or not Criag but it couldn't hurt. As far as HDMI cables go, most makes costing around the £15>£19 mark should be more than capable. Richersounds were doing a QED one for £24.95 (half price). I've yet to find anything truly significant over the "budget" cables from the likes of wharfdale (available @ Argos) £14.95. It may pay you to clean all previous ATI drivers from your PC. LOL Zeb , you out to make me insane arnt you. Hitting me when i am down. I like it. I think a new cable is in order then. I bought a good one for the PS3 a while back. Works fine @ 1080P on my 42" screen so might just invest in another one of them. I think it was about £9 from Asda Living stores. I use the same one on my Western Digital media player too , with no problem. The current cable on the PC was £3 from Amazon with free shipping. The only thing that makes me wonder is it worked with the 4870. If it were " jank " then would it have worked at all. ? Just basically what i am thinking. Report back when new cable is installed. Guys afaik you can crossfire quite a few different cards correct. ? Basically waiting for the sale of my 4870 today and then buy another 5770. thing is its going to be a different brand. 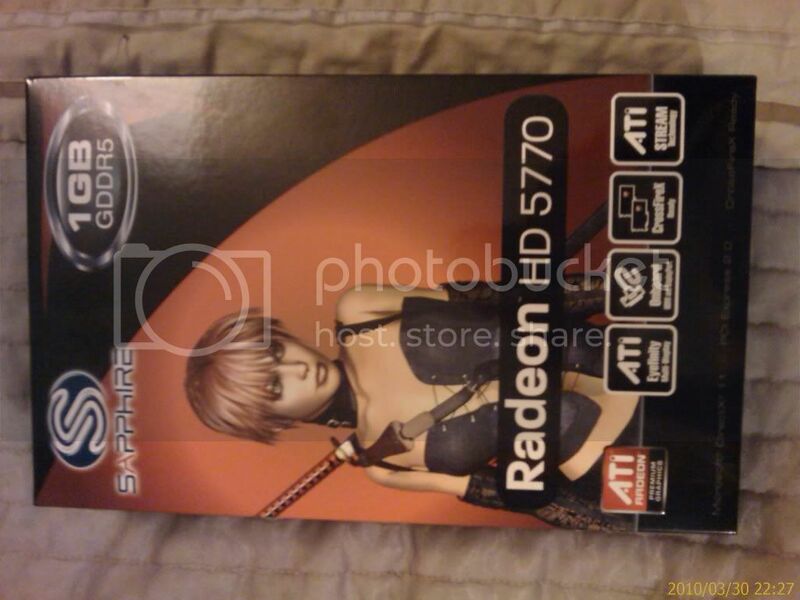 I have the Sapphire and will be looking at either an Asus cucube or a XFX 5770 1Gb. So basically the same cards. Will this work perfectly ?? As the results i have seen seem very good for the return. Should be around 5870 territory and exceed the 5850. ? Just got the new cable installed and its made an improvement for sure. Though i can now select other resolutions it blurs and shakes some when selected. No wobble though. I noticed that the NATIVE HDMI slot on this machine is sort of obstructed by the case pci slots. I think it could go more into the slot but due to the case and the chunkyness of the HDMI used its in as far as it can go. Maybe a cause. ?? could be can you fix it by removing the i/o plate? smduff wrote: could be can you fix it by removing the i/o plate? No , sorry to say not. Its the pci slots or brackets you may call them , which the cards slot into. The frame of the case is now flush with the graphics card. Before i had the adapter. Its stuck out and it was right in there. This time its being obstructed by this part of the case and due to the cable itself too. Maybe as a test i should nick the TV one and see how that slots in. ? Its a thinner HDMI head and may miss the case bracket all together , then at least i know if its relevant. How about the crossfire Steve ? Any 5770 will do the job yeah ?? Yup I have only one issue really but it really cant be noticed, the clock speeds are slightly different so one card is a little faster than the other and everyonce in a while I'll get a small flicker while gameing. Been told this does seem to happen with the crossfire. Its to do with the way the two cards manage the workload. Its got its faults but still works a treat. 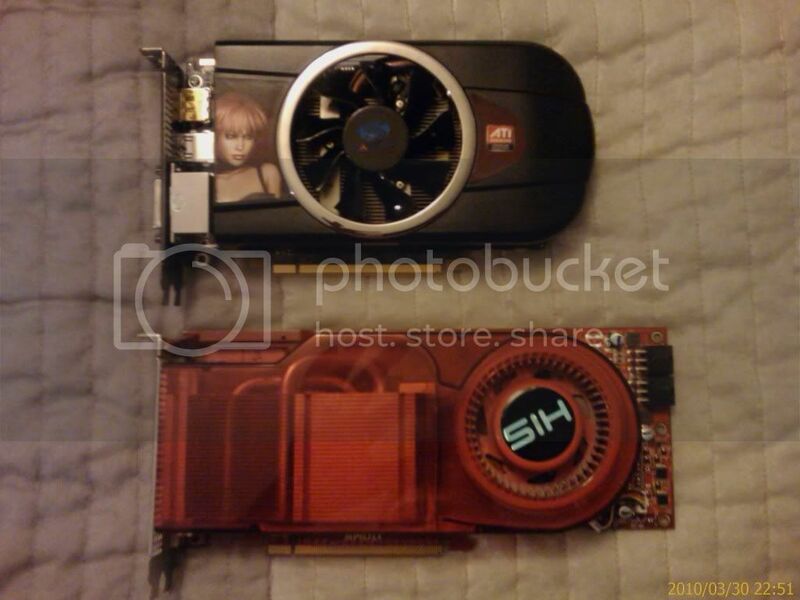 Great news BTW , managed to get a used Sapphire 5770 1GB older than mine though for £100 Delivered. So Crossfire is coming. More good news , the card i just bought is Brand new too. Never been opened. The guy won it in an OCuk raffle but he needs the cash. Should be here Wednesday or Thursday with some luck. Why bother , just get two more and go Crossfire X with 4x cards. Craig, anyway you could cut away some of the plastic on the cable or notch the part of the bracket that is in the way? On a side note, many HDMI cables don't allow the connector to go far enough into the slot and have to be trimmed. bob2701 wrote: Craig, anyway you could cut away some of the plastic on the cable or notch the part of the bracket that is in the way? Well it could be looked at. Though personally i would rather wait and put in the money for a better quality slim line cable. This way it should not touch the parts concerned. Though this new one has done it proud so far. Since using HDMI i have not notice any other problems with them going in the slots to be honest , though most of my earlier ones were slimmer looking. The later ones have beefier plastic around the head of the connector head , thats whats causing the slight obstruction. You would think they'd raise the native HDMI port slightly on the cards though. Its pretty clear on install this could happen quite a bit. maybe putting it in another point on the card altogether. Thanks for the info bob , appreciated as always. Hahaha !! Just playing around. You know the more i look at this 5770 crossfire the more i like it. Fantastic returns and they fly. Exceeds the 295GTX in some cases. Though i paid £225 for both these cards , inc shipping most of the funds were raise with things sold or monies put aside. I actually only spent £40 from my main bank account this month so i am happy. Well been playing with the screen settings with the new 5770 installed. Not using the CCC from ATI. The screen allows a HD colour setting to be enabled , something that did not work too well with the 4870. I had to use a custom scheme for that. Though just testing it out it works fantastically for the 5770 and now this resolution of 1280x720 (720P) has a real HD feel to it now. Its the sharpness , crisp display and rich colour. I am slowly becoming very happy with it and can only be chuffed to have another coming for a total 2GB graphics crossfire. Awesome. For those who are not main gamers these cards are a decent and cheap addition for any system. For gamers , just get 2 like me. You will have 5870 like performance gains. They produce like 90% gains in crossfire. Excellent return. Hey Craig glad to here ya got it sorted out m8. It should be awesome when the new card comes! 4hams wrote: Hey Craig glad to here ya got it sorted out m8. It should be awesome when the new card comes! I am still confused with the resolutions though. I am guessing the card just can display that resolution at the required refresh rate for the screen that is all. this screen requires at least 50mhz upto 75mhz with excellent effect. I locked myself out earlier. Changed the resolution to 1770x1000 ( basic 1080i ) and the screen went black and did not come back on. :( Waited for the thing to reset but it didnt. Had to basically grab the DVI - HDMI conveter from the 4870 box ( lucky i had not sent it off yet ) then plug the HDMI in to that. It booted windows fine and i managed to change the res back to 1280x720 as needed to be right. While on the adapter tried some other resolutions to rule out the hdmi cable not fitting the slot correctly on the native being the problem , well it did the same thing. Very shakey and really bad picture indeed. Though it displayed it. So back to the 720P setting with the HDTV setting enabled. So happy to be back , But it should allow a larger refresh rate i think on these cards. I don't think the problem is the card. i think it is the big screen you have? Did you not mention that it was getting a little old by todays standards? It probably will not display the higher settings due to the fact that it cannot display the refresh rates the card wants at the higher settings. I am thinking your on to something there Joel. Craig do you have a monitor to try out?